Departure time: 15h. Frequency: Daily from April to October, Wednesday, Friday and Sunday from November to March. Duration: 5 hours approx. Departure from: Plaza de Oriente, 8. TOLEDO is a Museum - city of great artistic beauty, it was a capital of the country and one of the oldest cities in Europe. 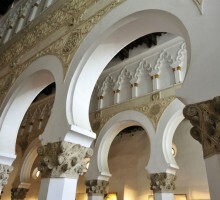 Toledo possess magnificient examples of architecture from different epochs, Muslim, Jewish and Catholic that make it one of the leading artistic cities in Spain. It was declared A WORDL HERITAGE SITE by the UNESCO. Toledo is known as the city of the three cultures, where they lived together Catholic, Arab and Jews. 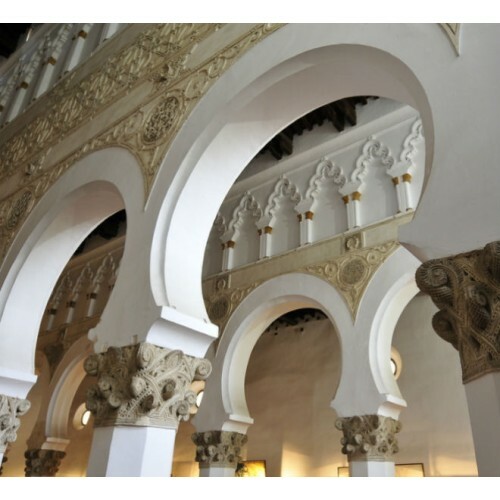 When you arrive, the is a SIGHTSEEING TOUR and walk through the city to admire its beautiful streets monuments: CATHEDRAL EXTERIOR and visit to the SANTO TOME CHURCH, the SANTA MARÍA LA BLANCA SYNAGOGUE an the CRISTO DE LA LUZ MOSQUE. You will also be able to admire, among the rich artisan crafts, the famous technique of "Damasquinado" (the inscrutation of precious metals on steel). The tour starts and concludes back at Plaza de Oriente,8 - WAMOS TERMINAL. **Pick up at hotel option only available for morning tours. For afternoon tours, meeting and departure point is: WAMOS TERMINAL - Plaza oriente, 8.